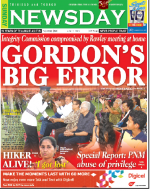 Published on June 16, 2013 in Complaints, General T&T, Integrity Commission, Media, People's Partnership, PNM and Politics. 12 Comments Tags: Anand Ramlogan, Attorney General, Keith Rowley, Ken Gordon, Newsday, Politics, T&T Govt. THE ACTIONS of the chairman of the Integrity Commission chairman Ken Gordon in holding a private meeting at his Glencoe home with Opposition Leader Dr Keith Rowley was a serious error of judgment which has now compromised the Commission as well as the Office of the President, senior political analyst Dr Hamid Ghany said yesterday. Ghany said the meeting, held on May 15 at the chairman’s resident at Newbury Hill, Glencoe, displayed “poor judgment” on the part of Gordon and now risks disrupting the appointment process which is currently being undertaken by President Anthony Carmona.